NCRC is committed to creating a healthy, inclusive workplace that supports a holistic approach to the wellness of its diverse community. On-site fitness programs, support for families and for breastfeeding moms, the Janus Safety Lab, an interfaith reflection space, and Green NCRC are just a few of the many ways NCRC improves quality of life for everyone in the NCRC Community. The North Campus Children’s Center (NCCC) cares for children ages 3 months to 5 years, offering childcare and early childhood education year-round, up to 12 hours per day. In addition to conveniently located childcare and support for breastfeeding moms–the NCRC campus has four private lactation rooms with Wi-Fi–the center also offers a summer camp program for school-age children. The NCCC is available to children of faculty, staff, and students, as well as those of Ann Arbor community members. NCRC now has a full-time MHealthy representative available in the Wellness Center for consultation. NCRC also hosts convenient on-site StayWell® Wellness Screenings with health professionals, who review blood pressure, cholesterol, weight and height data and provide individualized recommendations. MHealthy exercise and relaxation classes such as body sculpting, cardio, yoga, Nordic walking, and dance fitness are also among the offerings of the Wellness Center at NCRC. Other MHealthy programs offer weight management, ergonomics awareness, tobacco cessation, and support for mental and emotional health. NCRC also provides an Interfaith Reflection Room for prayer, contemplation, meditation and reflection in Building 14, Room D104. The Reflection Room is an inclusive quiet space for NCRC’s many diverse occupants, whether they ascribe to a religious faith or not. The NCRC Energy Management Working Group was formed in 2016 in support of President Schlissel’s 2015 Greenhouse Gas Reduction Committee Report and subsequent Greenhouse Gas Reduction Initiative. This document established a goal of 25% reduction of carbon dioxide equivalent or metric tons of carbon dioxide (MTCO2) for the University of Michigan by 2025. The baseline for NCRC was established at 60,000 MTCO2, for a 25% reduction goal of 15,000 MTCO2 by 2025. Over 100 completed projects have been identified by the NCRC Energy Management Working Group that would yield a sustainable reduction in greenhouse gas emissions. As of September 1, 2017, the group has documented a reduction of over 31,000 MTCO2, representing an achievement of over twice the established goal in less than one year. This is equivalent to the yearly energy use of 3,350 homes, using 3.5 million gallons of gas or burning more than 33 million pounds of coal. 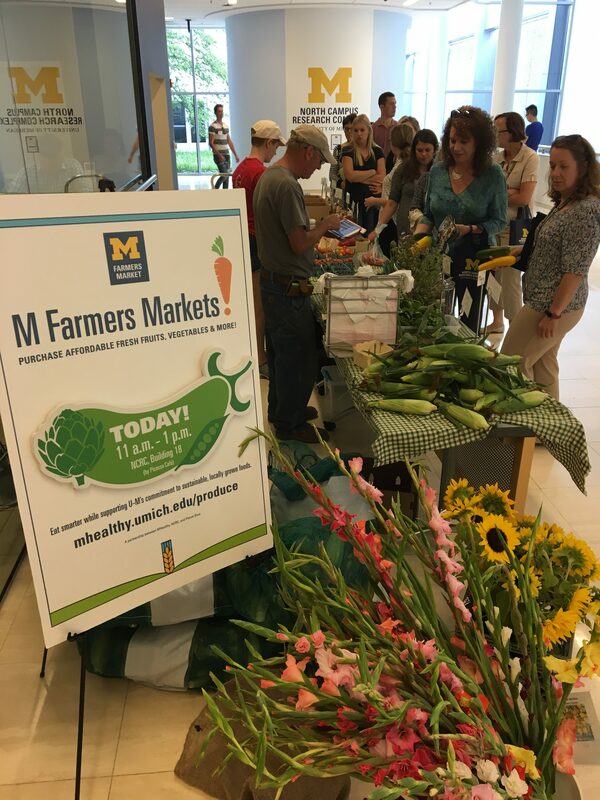 In addition to reducing CO₂ emissions through co-generation, NCRC has adopted the U-M composting program. All post-consumer waste, such as compostable plates, cups, flatware, bowls, napkins, and take out containers, along with uneaten or unwanted food, can be placed in specially marked bins at the usual locations. It’s easy to take green transportation to get to NCRC, too. While NCRC has ample parking, including paid visitor parking, as well as a Park & Ride Lot within one mile of NCRC, many NCRC employees bicycle to work, so bike racks are conveniently located all over the campus. NCRC residents are also able to easily access other U-M campuses on university buses and the city of Ann Arbor AATA buses, which offer several quick routes to Central Campus, the Medical School and UMHS, and downtown Ann Arbor. NCRC’s Janus Safety Lab, which opened in 2015, educates and raises safety awareness for those visiting the facility. A retrospective survey of 14 months of lab inspection data revealed that just 28 of 471 possible errors accounted for 58% of all mistakes noted by lab inspectors. NCRC has ensured that these items are reflected in the Janus Safety Lab. A variety of safety and health topics are presented, including biological safety, chemical storage and labeling, electrical safety, fire safety, compressed gas use and handling, personal protective equipment, and hazardous waste management. The NCRC also has a Building Incident Response Team (BIRT) program to ensure a safe community. The BIRT program was developed by the Office of Emergency Preparedness in concert with the University of Michigan Police Department, using best practices from emergency first response disciplines. NCRC Building Incident Response Teams are led by NCRC Facilities; team leaders are appointed BIRT Liaisons, and are trained to interface with first responders. Together, BIRT Liaisons and BIRT Members will assist in quickly evacuating buildings due to a fire condition, or directing people to shelter in the event of severe weather. Each year NCRC hosts the NCRC EXPO, an opportunity for groups that enhance the NCRC Community’s quality of life to promote their offerings. In 2016 more than 20 service units at NCRC participated, showcasing their work for over 500 visitors. Questions about NCRC Amenities? Go to ncrc.umich.edu/life-ncrc/occupant-amenities.